It’s that time of year again! Sometime in the next week or two, Tristan will be getting a bath to dig in and get rid of the winter grime that’s worked its way in to his coat. I’m only waiting for the right conditions: enough time to properly bathe him, and enough sun to dry him out. I did a brief inventory of my bathing tools last night. Big sponge, check. Sweat scraper, check. Small bucket, check. One of my favorite scrubbing tools is a basic jelly scrubber. I have small hands, so when I can find a child size I buy that. I think it does the best job of scrubbing in the shampoo and massaging the skin. I also have two bottles of conditioner. I am of the camp that believes in conditioning every time I bathe; shampooing removes natural oils and can leave the skin dry. Tristan isn’t nearly as sensitive as many other horses, but I love the soft shine he gets after a good conditioning. Part of my bathing routine is also to work conditioner fully into his mane and tail and let them set for quite a while, then rinse out, picking out snarls. It makes a huge difference. Here’s the big gaping hole in my kit: shampoo. Last year, I ran out of the most recent bottle I’d bought: Cowboy Magic Rosewater Shampoo. It’s on the expensive side – usually around $8 a bottle – and while I’m perfectly happy to spend money on things that make a difference, I’m not really sure that this did. In the past I’ve used whatever’s on sale at Walmart or the grocery store: Suave, V05, whatever’s around $1 a bottle. I’ve noticed a difference in quality of conditioner – both for him and for me! – but never in quality of shampoo. Before I buy a new bottle of something, I thought I’d put the question out there. What do you use? Do you think it really makes a difference? Do you go cheap & generic, or do you have a particular brand you swear by that costs more? Do you have a multi-step system? Seeking all opinions! 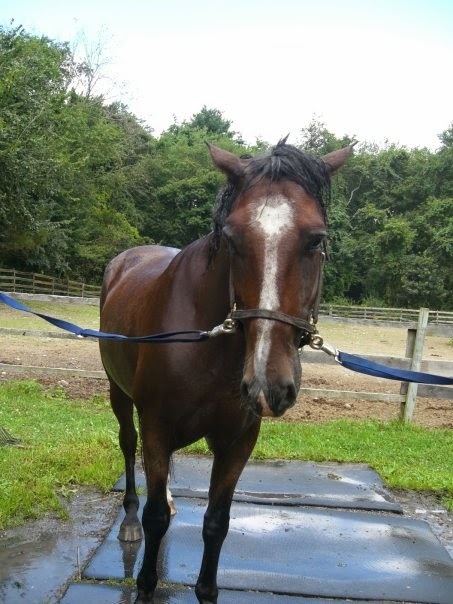 Next Post Soapbox Moment: Train Your Horses! I have a ton of shampoo and alternate. I used to only use vetrolin shampoo but then started using the sore no more massage shampoo after hard rides and really like it. I use head and shoulders for his legs, mane, and tail. No conditioner just sprays and detangler or shine serum for the tail. We make our own: 1/8 cup natural dish soap (unscented, we prefer, because of my allergies, 7th generation free and clear is usually what we have in the house; I bet you could use a pure castille soap, too), 1/8 cup vinegar (apple cider is the best conditioner for hair and skin, but white makes the all important PH adjustment and works well, too), 1tbsp glycerin (if you have it as it makes a nice conditioner/softener, but is not essential) and 2 cups water, shake or stir well. It may not sudse as much as commercial products, but it cleans well without irritating the most sensitive of horses (or dogs, we found this recipe because of my super allergic pup). I don't condition after, except for a little detangler in mane and tail, but you certainly could. I, uh, use Ivory dish soap. I have a bottle of the fancy MicroTek shampoo that I got while battling…some kind of skin crud, I assume? I can't actually remember what kind, but surely there was something or I wouldn't have bought it? And it's nice stuff! And when I have proper shampoo, I enjoy using it. But I've never noticed it working any better than the Ivory. Horse gets clean, coat feels nice, job is done — so I stick with the cheap stuff most of the time. My favorite is the Vetrolin shampoo. I just love the way it smells. I usually use mane&tail because it's cheap and those huge bottles last forever. I've also used cheap human shampoo and more expensive horse shampoo. I'm picking about whiteners, but I haven't noticed a huge shampoo difference. I actually don't use shampoo very often. I'll sometimes shampoo a really muddy tail end, or muddy legs. Otherwise, I rinse the coat and then sponge down and scrub with a mixture of apple cider vinegar and water. Then rinse again. The vinegar acts as a conditioner (and, the SHINE you get!) and it cuts through grease and funk in the coat. I love it. I also love that it's ridiculously cheap. Who can say no to a 99 cent bottle of awesome?